The programme for this year’s Mobilism conference in Amsterdam looks hot, hot, hot! It will wrap up with that hottest of hot things: a hot topics panel. Hot! By the way, there are still tickets available. I suggest you grab one if you haven’t already. It’s a great gathering but for some reason it’s not selling as well this year, which means this could be your last chance to attend. I’ve really, really enjoyed the previous two Mobilisms, and I always get a kick out of moderating panels so I’m pretty chuffed about getting the chance to host a panel for the third year running. The first year, the panel was made up of Mobile browser vendors (excluding Apple, of course). Last year, it was more of a mixed bag of vendors and developers. This year …well, we’ll see. I’ll assemble the panel over the course of the conference’s two days. I plan to choose the sassiest and most outspoken of speakers—the last thing you want on a panel is a collection of meek, media-trained company shills. Mind you, Dan has managed to buy his way onto the panel through some kind of sponsorship deal, but I’m hoping he’ll be able to contribute something useful about Firefox OS. Apart from that one preordained panelist, everything else is up in the air. To help me decide who to invite onto the panel, it would be really nice to have an idea of what kind of topics people want to have us discuss. Basically, what’s hot and what’s not. So …got a burning question about mobile, the web, or the “mobile web” (whatever that means)? I want to hear it. If you could leave a comment with your question, ‘twould be much appreciated. I spent the last few days in the beautiful surroundings of Amsterdam for Mobilism. ‘Twas an excellent affair: a well-organised, focused single-track conference. It may have helped that Amsterdam itself was looking bloody gorgeous for the duration. All the talks were great but I was particularly happy to finally hear Bryan and Stephanie Rieger having so often favourited their presentations on Slideshare. They both blew my mind, though I’ll admit to a certain amount of confirmation bias in hearing their Content First message. 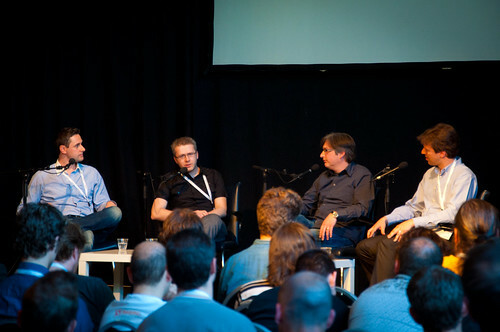 For my part, I moderated what I believe may have been the world’s first panel dedicated to mobile browsers. I thoroughly enjoyed myself …somewhat at the expense of the panelists. There were representatives from Opera, Nokia and RIM present, ready and willing to take their punishment. They were the ones brave enough to actually show up. Despite PPK’s best efforts, there was an Apple- and Google-shaped hole on stage. Apple never sends anyone to any event to speak on behalf of the company. And Google were clearly just too chickenshit. So kudos to the mobile browser vendors that did have the guts to take a grilling from web developers. The panel got quite technical for a while—which you may or not find boring, depending on how much of a browser nerd you are—but once we moved on to more philosophical bigger-picture questions, it got very interesting indeed. Luke took some notes and the whole thing has been recorded for posterity. Oh, and a big “thank you!” to everyone who took the time to answer my request for questions.